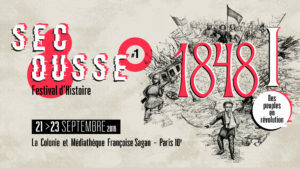 Our first project of grand scale is “Secousse”, a transmedia history festival on the revolutions of 1848. “1848! Peoples in Revolution” will take place on the weekend of the 21st to 23rd of September 2018 at La Colonie and at the Médiathèque Françoise Sagant in 10th arrondissement of Paris. To celebrate the 40th anniversary of the magazine, La Boîte à Histoire directed a short film on the history and development of L’Histoire. Tracing the internal organisation of the magazine from its creation in 1978 until this present day, the film deals with the magazine’s identity, its uniqueness in the publishing environment, and the reasons of its success. Through interviews of historians and journalists, as well as a unique access behind the scenes, the film allows to have a better grasp of France’s most popular history magazine. The movie is designed as an original communicational tool to present the magazine to a wider audience, to current and future readers. Indeed, it aims not only the readers of the magazine as it introduces L’Histoire to potential new readers. This product is a veritable calling card of the magazine that could used for marketing or during conferences, festivals etc. Moreoever, this video has been made possible through a partnership with Ina SUP – section montage and postproduction.